Democracies are transforming worldwide, but at the same time political inequality is increasing. This development threatens to leave growing portions of mass publics effectively `outside' the political process. 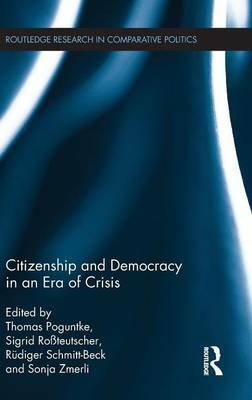 This volume brings together leading authorities in the field of democratic citizenship and participation to address pertinent questions concerning the quality of the democratic political process at the beginning of the twenty-first century. Analysing causes and consequences of recent developments in democratic governance and citizenship, it contributes new and original research to the ongoing debate on the crisis of representative democracy. The contributors deal with a broad range of issues including aspects of democratic citizenship and citizens' perceptions of system performance, political inequality and the democratic impact of participatory innovations. This book will be of key interest to scholars and students in democratization studies, democratic citizenship, comparative politics, political sociology and political participation.